-Seen It- Four old University pals (headed by Rafe Spall, ‘The Big Short’/’Prometheus’) go trekking in the Scandinavian wilderness to honour a murdered friend. Shortcutting through dense, sinister forest they spend a night in an abandoned shack, one that’s occupied by an unsettling Nordic artefact. Experiencing horrific nightmares they emerge the next morning realising they are lost, and something large and unholy is in pursuit… From the American director of ‘Southbound’, this adaptation of the novel makes for a fine British horror. Sitting somewhere between ‘Blair Witch’, ‘Wicker Man’ and ‘Troll Hunter’, it’s propelled by great chemistry and well observed, witty dialogue among the four men. Rather that the usual contrivances, everyone reacts as you’d imagine middle class Brits in their 30s actually would. The atmospherics are smart and eerie, with the night in the shack providing the most memorable chill. The sharp tension and ensemble entertainment slip a bit in the final act as it transitions into a creature feature and the group is broken up. Still, Rafe Spall gives an understated, grounded performance throughout, a cut above what’s typical for the genre. -Seen It- A professor who debunks ghost encounters (Nyman, who also co-directs) is summoned by a retired sceptic, his childhood inspiration, to disprove three cases that still perplex him on his deathbed. He sets out to interview a glum night watchman (Whitehouse, ‘The Fast Show’), a nerve-shattered teen driver (Lawther) and a cocky, rich new parent (Freeman, ‘Hobbit’), all of whom claim to have had a life-changing and terrifying supernatural experience. As the professor himself starts to be spooked by fleeting visions, he wonders if a greater game is in play… An adaptation of the stage play, which has been running on and off for 7 years, this is written and directed by its creators Jeremy Dyson (of ‘The League Of Gentlemen’) and Andy Nyman (best known for his work with psychological illusionist Derren Brown). It’s a very British film that takes familiar beats and ideas from old ghost stories (including ‘A Christmas Carol’) and has fun with them, never afraid to go for a big laugh or big scare. They’ve had plenty of time to fine tune the tale on the stage and it’s led to a cleverly weaved story within a story. 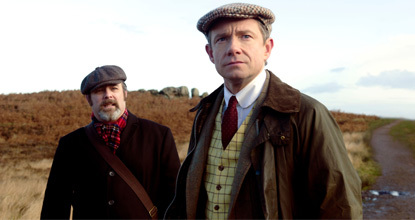 Andy Nyman’s lead performance is unassuming but relatable, Martin Freeman has campy chilling fun, and Paul Whitehouse shows he should get more film work as he nails his segment with pathos, humour and believability. The three main suspense sequences build well, but their payoff jumps are a little underwhelming (“Oh that ghost lady’s wearing a lot of stage makeup”), it’s actually the unexpected scares in the bookending story that have more impact, and the closing moments that are most haunting. -Seen It- A biologist’s (Portman) military husband (Isaac) returns from a secret mission a broken man, before falling into a coma. He had been sent into “the Shimmer”, an expanding area of unnatural and dangerous mutations which began from a comet. To help save him she volunteers for the next (suicidal) mission, joining an all-female team of a psychologist (Leigh), paramedic (Rodriguez), physicist (Tessa Thompson), and geologist (Tuva Novotny). They hope to uncover what is happening and why, but as they approach its center the DNA mutations run amok may kill them all… Adapted from the 2014 novel by writer-director Alex Garland, on a red hot streak of form after ‘Dredd’ and ‘Ex Machina’ (having written the likes of ’28 Days Later’ and ‘Sunshine’ before that). 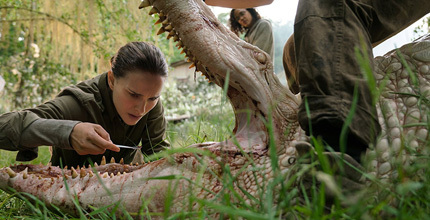 ‘Annihilation’ is scattered with memorable nightmarish imagery, its DNA concept is deeply creepy, the wildlife creature design is great, and there’s a powerfully strong sense of mystery throughout. There’s some interesting discussion of self-destruction but you’re not left with much to think about as you were after ‘Ex Machina’. It’s also, honestly, a pretty bleak, slow and humourless film with an ending different to the book that doesn’t make a whole lot of sense. -Seen It- A lumberjack (Cage) lives a peaceful reflective life with his artist partner Mandy (Riseborough, ‘Oblivion’) in a woodland cabin. When she catches the eye of an insane, insecure cult leader (Roache, ‘Batman Begins’), he and his followers, helped by a demonic biker gang, kidnap and destroy her, leaving the lumberjack for dead. In despair and fury he forges a battle axe and tracks them down to enact a bloody revenge… Director Panos Cosmatos (son of George P. Cosmatos who made the great ‘Tombstone’) establishes himself here as one of modern cinema’s most interesting visual artists. It’s all set in a dreamlike 1980s that’s both mellow and menacing, with striking hypnotic visuals (right down to the onscreen chapter-title cards). It’s underscored by a constant droning era soundtrack that haunts with its love theme and flares up to punctuate the madness (the Icelandic composer has sadly since died). The visuals are constantly experimenting in effective ways, from juxtaposing the faces of two people in conversation to the jarring unstylised master shot showing Cage having a bathroom breakdown immediately after the attack. In the often hyper-stylised version of reality, with the ramblings of the thin-skinned cult leader and his fawning drugged-up followers, Nicolas Cage is for a time the most normal thing onscreen. But he soon absorbs the cosmic darkness and descends into blood-splattered insanity (while the film itself becomes more narratively straightforward following one-by-one revenge). Cage is luckier to have this film than vice versa. He’s hurt his currency with endless terrible films, and his onscreen rage meltdowns have become familiar. 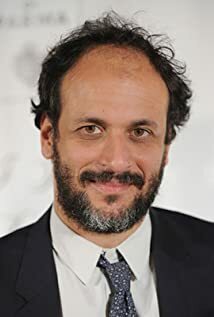 The filmmaker is good enough to have carried another actor on that journey of madness, and having one who hadn’t gone this route before would have added to the originality displayed in other departments. That’s not to say Cage isn’t effective, or that it isn’t his best film for years.